Trench 1" wide, adjust up to 8" deep WITH TRENCHER BLADE. This allows for cutting depths of 2, 3 or 4" on the bed edge. Superior ManeuverabilityCaster steering allows unrestricted turning. 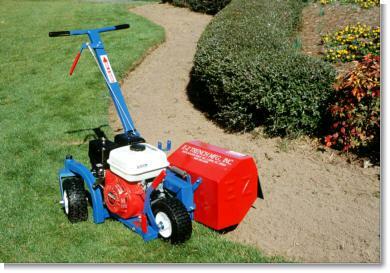 A Honda GX160 provides 6.5 HP consistent performance and reliable power. Carbide-tipped cutting blades cut through the toughest soils and roots. * Please call us with any questions you may have about our edger large edger or bedscper small tre in Kingsport TN, Johnson City, Elizabethton, Rogersville TN, Gate City VA and the NE Tennessee, SE Kentucky and SW Virginia Tri-State Area.